I think that adding comma would be good. So you get 1,653,686 damage displayed. Maybe an option to increase delay, so you could see number AND ability which caused so much damage/healing. What concerns shortening numbers, I am not fan of it. There are people like me, who care about each detail, and like to keep some good logs without rounded numbers. And it causes very big fluctuations when you try to analyze data. 3peso's tweeted the patch will be out in a day or two! Although apparently there's a bug Still, hype. The update is now out. I can't read the patch notes unfortunately, since I can't read Japanese. uhh, Meiling's Chinese Girl's Qigong wasn't changed? And rip no Slv buff to Akyuu spells. Ah, looking at Keine's Library, 250f Corridor boss had its HP increased a lot. Went from 8.2m at level 184 to 10.3m. I think some of the Corridor Touhou bosses also had some buffs, I don't remember their old HP though. 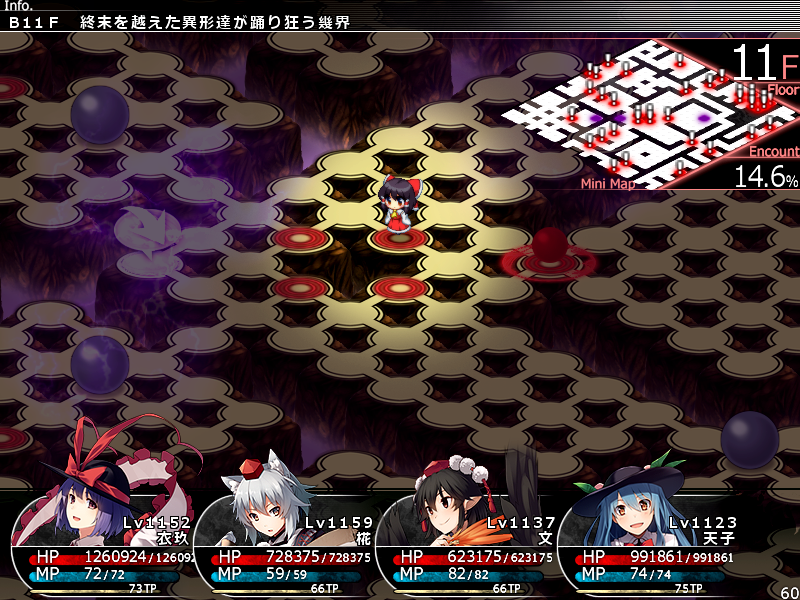 Abyss Mokou has marginally more HP than Abyss Kaguya, the latter used to have a lot more. I'm pretty sure it was a buff to Abyss Mokou. Also of note, the % bestiary achievements were changed I believe. I also unlocked two as soon as I started up the game. I believe the final one is for having 600 monsters logged. EDIT: The 512F Infinite Corridor achievement was also changed to 640F? Rip Sakuya. Looks like the Extra Attack nerf's not been changed (at least looking at that changelog) and while all the other extra attackers can manage it, Sakuya seems like she's just plain bad now for it. Now I'm gonna be waiting on the translation patch. 390 more floors past 250f means 39 bosses, and 35 of them should be Abyss Touhou bosses, so 4 new non-Touhou Corridor bosses then? Sounds like it's equivalent to "beat every Corridor boss". I'll try and update the .exe tonight. Has anyone tried contacting Deranged? You're awesome. This is just what I was hoping to see! It's been ages since I touched this game - how far is the plus disk translation? I've been interested in starting up a new run again to finally check that part of the game out since I haven't gotten to. I lost my old saves anyway because of computer transfers and what not, so... guess I'm starting fresh! Anything that might be important to know? Last I played was when the first ever plus disk trial came out, so... a while ago. So you need to advance deep enough in Infinite Corridor to access some of 30F sections? How deep is enough? Is it just some bonus section or it contains true mega final boss? What's in the end of B11F? Dunno yet. I started exploring B11f but it's a huge mess of those metal ball puzzles so far, and there's probably a lot more to it than that. It's huge. But, it is possible to see a boss icon from the 30f relay point now, so there's at least one boss there. Translation isn't fully complete especially not that we JUST got a new content update, but the entire story and gameplay relevent things have been translated for a while, only mega-postgame stuff hasn't been finished. Now's a very good time to get back into it. Game's now (i think) fully feature complete and the translation's just got to fix some changed strings and finish the last several dialogue boxes for super postgame stuff and it'd pretty much be considered fully complete. For all intents and purposes, this is it. It shouldn't be very long before everything's done and stable. Oooh, awesome to hear, that gets me even more pumped to play! I figure I'll be caught up with the maingame for a good bit anyway so it's not like I'm rushing ahead into untranslated areas and the most functional stuff is still there. Hell yeah, now I'm really excited to get back in. It seems to only have an orb at the end to let you progress on 30F. Behind the red rock is another rock requiring you to do something on 29F, I'm assuming beat all of the 29F bosses. I haven't beaten Demifiend yet, damnit. I'm going to sleep for now, but you can bet I'm going to do everything I can tomorrow. The area after that rock in 30f contains the heavenly versions of the bosses, they're scattered all around and you need to beat them to keep exploring the floor. EDIT: Oh damn, the bosses respawn each time you enter the area, so its basically a boss rush, thankfully, it seems you don't really need to face every boss to advance, though I also found some rocks that require having beaten multiple of the bosses to advance. The bosses you face in each encounter seem to be random, so it won't be the same boss always in the same location. And what levels are they? Probably very, very high. I played just a few minutes untranslated to peek in at b11, and let's just say, if it's taking someone longer than 4-5 hours to hit level 2000, they're doing it very, very wrong. The exp in-flow is so extreme now that it will take NO TIME AT ALL to just skyrocket to absurdity. And that's just there, who even knows what IC and floor 30's payouts are going to look like. Not that high, the lowest I have met is Heavenly Minoriko at 1230 and the highest Heavenly Yuuka at 1350. Also, nevermind what I said before, there are shortcuts to your objectives, so you only need to defeat 2-3 bosses at a time. Also, some random boss highlights; Reisen can use Red Eyes of Sun and Storms as a buff that seems to give her the status resistance ignore for her next attack (which seems to always be Lunatic Red Eyes to SIL your entire frontline), Yuuka will Master Spark you if you use FIR attacks against her, she also has the regen from Protection from Plants, Iku can use Flexibility to turn any DEF debuff into a permanent increase to her DEF, as well as Orb of the Five Clawed Dragon as a permanent self MAG buff, she also has Magic Counter. EDIT: After double checking, it seems I was wrong, each Heavenly Boss has a fixed location. You don't need to defeat all of them to advance, but there are rocks with equipment/materials behind them that require you to defeat a certain amount of them at once. There are 2 areas with Heavenly bosses (the first has 22 bosses and the second 38), the rocks of each area only count the bosses of that same area (so if you need to defeat 4 bosses to unlock a rock from area A, defeating 4 bosses from area B won't work), in each of the 2 areas there's a rock that requires you to defeat all bosses there to unlock, so it boils down to two boss rushes, one with 22 and the other with 38 bosses. Meiling's Qi-Gong bug was fixed. For reference, Blood of Superhuman now raises Byakuren's stats permanently by 5% each time she's healed, to a cap of 40% (% based heals still don't heal her completely though). Vampiric Attack got its numbers raised, now it heals 16% of the damage done and when using single target attacks raises all stats by 8% and increases damage done by 16%. Huh, there really is nothing besides a switch in B11f? As far as I can tell I've completely explored it, but there's a portion of the floor that seems utterly purposeless. Admittedly I did this part of the floor at 3 AM and don't remember it very well, but was there anything here? This entire portion of the floor doesn't appear to have anything despite the convoluted metal ball puzzle. No items, no teleport blocked off, no bosses. I must be missing something, if I didn't just forget it due to sleep deprivation. I believe I explored everything too. The only things on the new patch version of the floor are the puzzles, the switch and four locked chests containing a Scourge, BFG, Platinum Card and a Medicine of Life. I doubt this mean much to Byakuren - offensively, she's still heavily outclassed, and defensively... well, she does well, but I haven't yet found the game requiring an especially strong tank (to the point I can just keep Suwako in the front without much worry), and Renko is just so damn sick in comparison thx to Maintenance making status/affinity coverage much easier. Remilia, on the other hand, sounds quite damn improved. Do you think this might make a "half SDM" team (like Remilia, Flandre, and Meiling) viable? Hm, same here. I would wager that something might appear with 30f or Corridor progress then. I've begun exploring 30f now, but I think I'll do some Corridor after checking the immediately available Heaven bosses. Incidentally, I read on the JP BBS that after hitting Corridor 640f, the Corridor bosses start looping again (I.E. Abyss Reimu is 650f, Abyss Marisa is 660f, etc). That answers how that's going to be handled. First 4 Heaven bosses available are Minoriko, Reisen, Rin, and Sakuya. Based on Minoriko's AI pattern they seem to be fight identically to their Corridor equivalents. Meiling is already a monster by herself, and Flandre is worthy solo as well, so if Remi's been buffed into higher usefulness, then... there you go! It's unfortunate about Private Square, but I imagine Sakuya is viable too when you're already using three people. Killing Doll scales better in a postgame where def/mnd no longer rule everything, and Akyuu could help enable her awakening attack boost. Although I'd still rank Patchouli as a "maybe..." even when using all the other members... First Aid Kit or Tokugawa Statue and all the HP boosts at least get her to something workable I guess?? And her low def becomes less catastrophically low, along with less important in general. With how endgame works, I think Byakuren, while not a half-bad choice in general, is mainly only the ideal choice if you're using the characters who piggyback on her like Shou, and Nazrin- who becomes viable with her awakening, even if you still moreso pick her for grinding assist than bosses. Grind is a good portion of endgame, after all, so that's actually pretty relevant for a party slot. My assumption is that the original intention was that you needed to complete the puzzles to even access the warp that got you to the third area, but 3peso made some mistake with the map and now you can straight up skip all that. You do need to clear ball puzzles in order to get to the warp for the third area. And then there's way more ball puzzles in there to lead to the switch. Of note, after completing the floor, all of the coloured switch gates on the floor are gone. Interesting. EDIT: Wait actually I see what you mean now, so you *can* access the third warp. Dang, that's weird. I think I'm going to go do a bunch of Infinite Corridor stuff since I think I need more stuff to explore 30F comfortably. Also, I want to share my fight against the last 29F boss because it was ridiculously difficult for me. It took me about two hours of actual attempts to end up getting strategy down to beat it. Maybe I made it harder on myself or something accidentally, but I don't know. The video is still processing right now so the quality isn't going to be good for a little while, but. My main worry is that both Patchouli and Sakuya lack the sheer amount of multipliers, coupled with favourable attack multipliers, to make the difference. Compare, for example, Patchouli and Kanako. Sure, Patchouli's MAG is a bit higher, but Kanako gets +32% damage from Desperation and an extra +50% from Divine Authority. Meanwhile, Patchouli simply gets slower delay, sometimes - which is not as important at this level. Oh, and I didn't even count the fact Kanako's Mad Dance can be boosted by Sanae's +SPI damage skill (and I even use Nitori for +CLD damage). Meanwhile, Patchouli's only good source of sustained damage on bosses is Silent Selene and... I don't really think using both Marisa and Patchouli in the frontline is particularly wise. I tend to agree, though grinding XP/gold/items is so damn easy as it is that I have yet to feel the need to use Shou in the first place.